Art critics might choose from a range of theoretical underpinnings – or none. Amongst these is the psychoanalytical, which was begun by no less a figure than Freud, with his 1910 study of Leonardo da Vinci. This approach became very popular in the mid-twentieth century, although many claimed that it was an irrelevant personalising of the discussion of art: does it really help us to understand an artwork because we are provided with insights into the psyche of the artist? All the same it fed a whole branch of critical theory that is associated in particular with Jacques Lacan and this continues to inform the discussion of art today. Other critics have preferred to adopt a Jungian approach and view the artist as revealing universal, rather than just personal, truths. 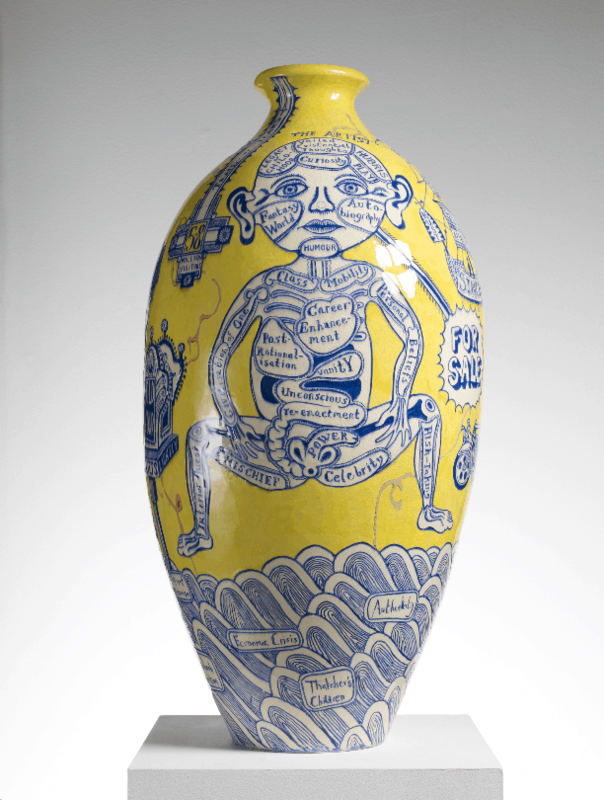 Whatever angle a critic might wish to adopt, it would be very difficult to ignore the psychological in the Grayson Perry exhibition at the British Museum, titled The Tomb of the Unknown Craftsman. In the catalogue essay, Perry referred to his ‘great psychic war 1965-75’, which included a long time in psychotherapy. In his art he is simultaneously referring back to his childhood traumas and transcending them. He is knowing: both of himself and of the human condition. Amongst the dualities in this exhibition was an enchanting mix of the personal and the universal. However, the most apparent duality was between Perry’s own artworks and those he selected from the extensive British Museum collection to be shown beside them. As he told it, these ‘conversations’ between a contemporary artist and a museum collection usually result in an artist producing work in response to a museum’s holdings. He reversed this and selected the British Museum’s artefacts in response to the work he had been doing. In this case at least it worked supremely well, with each benefiting from proximity with the other and becoming more than the sum of its parts. 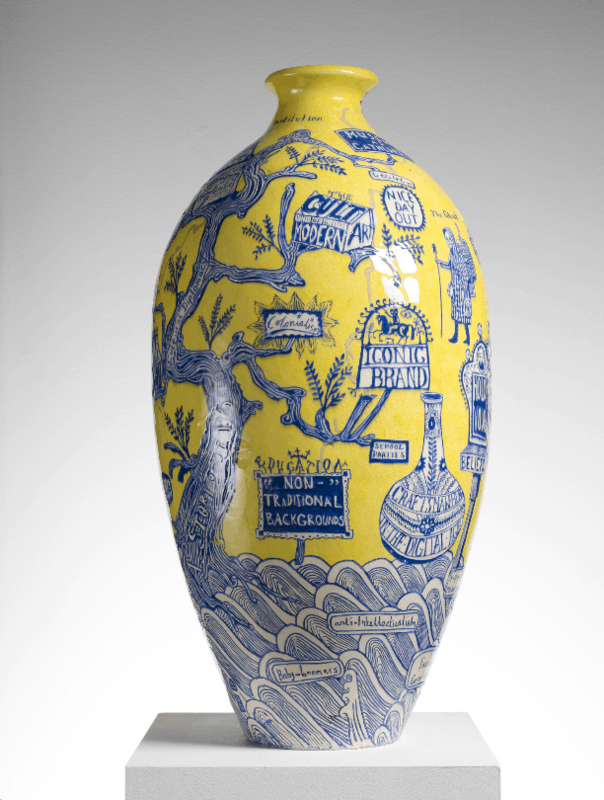 Perry most often works in ceramics, producing traditionally shaped pots, which are decorated with rather cheeky, somewhat artless and awkward, but invariably entertaining drawings and words. Often there are figures with speech bubbles and captions added. Sometimes found images and photographs have been collaged giving the surface the appearance of a three dimensional sketchbook or scrapbook. They reward close inspection and take a while to read, since you need to walk round the pot to see all the decoration. He is very aware of the tension between the more orthodox shape of the pots and the more subversive images on their surfaces and sees this as a struggle between two sides of his artistic personality, which he calls ‘the hobbit’ and ‘the punk’. An example was ‘The Rosetta Vase’ of 2011. The Rosetta Stone was not included in the exhibition, but it can be presumed that the title refers to the idea of something that’s difficult to interpret, but when after long effort it is deciphered, then all sorts of other meanings can be revealed. It had a blue and white, highly stylised figure on one side, which vaguely resembled depictions of eastern deity. The figure had been divided up into sections, rather like a medical or butcher’s diagram, each of which had a different appellation written in old-fashioned, serif script. It looked a bit like something from a distant culture crossed with the imagery of the Enlightenment, when there was an overwhelming need to name and classify everything. But this juxtaposition was further subverted by the choice of bright yellow for the negative space that surrounded the imagery, which Perry acknowledged with a little sign reading: ‘non traditional background’. The figure was called ‘The Artist’ and it is safe to assume it was a self-portrait. It was also clear that the names allotted to each of the sections of himself referred to his own psyche: ‘veiled existential thoughts’, ‘legacy of childhood’, ‘hubris’, ‘play’, ‘curiosity’, ‘fantasy world’, ‘autobiography’, ‘humour’, ‘class’, ‘mobility’, ‘ vanity’, ‘unconscious re-enactment’, ‘interior quest’ etc. Like all of his pots, it had to be seen in the round and more or less on the other side was a spidery tree, which was not so much a tree of knowledge as the sociology of the British Museum. Hence this had captions such as ‘story of the world’, ‘neophilia’, ‘colonialism’, ‘post-Diana society’, ‘contemporary art as added value’. There was much more to hold your attention in this one pot and this article could be dedicated to discussion of this work alone. But to cut to the chase we saw Perry’s self-deprecating sense of humour, interest in his own psychological development and links to the broader context (in this case the British Museum); a style which while borrowing from and subverting many forms is unmistakably his own and a clear desire both to communicate and to give pleasure. There is a branch of criticism that can be very sniffy about art that is entertaining. According to this view, if art is to be taken seriously then it should be taken like medicine and artists who sugar this pill are to be treated as suspect. To entertain is to descend into the popular and if something is very popular then it cannot be serious. This view is nonsense of course. Two people could present a lecture on the same subject; one could be boring, the other entertaining. In both cases the content might be just as difficult. All of the pinnacles of the arts manage to be both challenging and entertaining, from Shakespeare to Van Gogh. For weeks before visiting this exhibition I had been meeting people who were enthusing about it and telling me I must go. It was hugely popular. But it was also profound. It has to be acknowledged, however, that rolled into the package of Perry the artist and curator of this show, is Perry the person well known as a transvestite. This knowledge doesn’t tell us anything about the quality of his work, but nor can it be ignored when discussing it. This is not only because it presents another of the many intriguing dualisms of this exhibition – in this case male and female – but because he makes a great deal about the significance of his father, who having been much less than an ideal parent for the young Grayson, then left. Into this absence Perry invented a rich tapestry of fantasies, in which his teddy bear, named Alan Measles, often played a leading role. He told us that through psychotherapy he came to realise that Alan Measles was what Winnicott termed a ‘transitional object’, through which Perry could project his fantasies of maleness. But maleness doesn’t only reside in his teddy bear: Perry likes to ride motorbikes and the earliest example of his own work was of a motorcycle helmet he made in 1981. This had a motorcycle on the top, but you had to look twice to recognise it, since the style was of some ancient artefact of war dug up in a field. Old and contemporary is another dualism he playfully explored. One trick of curatorship is to provide didactic pairings of artworks. This was not his intent. He chose many works from the Museum’s ethnography collection, many of which echoed his sensibility. Instead of a western tradition of art based on observation and accurate depiction, he favoured distortion and works that showed not so much what we see as what we feel and know. Above all, nearly all his selections had an innate power. Although removed from their original location and function, we felt their force even within this altered cultural context. The exhibition was divided into sections linked by themes such as Sexuality and Gender, Shrines, Magick [sic], Craftsmanship, Souvenirs of Pilgrimage. For each section there was a grouping of his work, artefacts selected from the Museum’s collection and some perceptive captions he had written. The themes worked well. On the face of it they seemed diverse but they always referred back to his own preoccupations. For example, ‘Souvenirs of Pilgrimage’ was in part informed by a sort of cathartic pilgrimage he undertook with Alan Measles to Germany. They travelled on a highly flamboyant pink and blue motorcycle, with his teddy bear sitting above the rear wheel in a specially made, vibrantly coloured house or shrine. Perry explained how as a child he imaged Alan Measles as a Second World War warrior taking on the Germans. This pilgrimage was in part to prove that Germans were not the enemy and thus ‘to make peace’. Since he must have known this anyway, it is to be presumed that the peace he sought was inner, which is often the goal of the pilgrim. Often the journey has changed us even before we reach the destination. It is not just a metaphor: it heals. Perry is far too perceptive not to have realised that visits to the British Museum – and this exhibition – can also be thought of as contemporary pilgrimages and many galleries and artworks as kinds of shrine. Amongst his own works that he chose was a drawing called ‘Pilgrimage to the British Museum’. Craftsmanship was another major theme of this exhibition. On the face of it any interest in craft by a contemporary fine artist can seem strange. After all, artists have been denying the craft within their work since the Renaissance, in large part to raise their status. Modernism accelerated this division, as the concept of skilled work was replaced by that of talent (or even genius). Many contemporary artists choose to have somebody else actually make their work. Perry is once again hard to pin down in this important area. As somebody who makes and decorates pots it is clear his practice encompasses craft. On the other hand, he also produces artworks that are made by others in media such as metal or textiles and examples of these were included in the exhibition. In most of the latter type I was more aware of the skill but less of the cheeky charm which emanates from his pots. It was as if in giving up this control the ‘punk’ was partly eclipsed by the ‘hobbit’. Craft for Perry does not seem to be the kind of democratic notion of a skill anyone can learn through hard work, as Richard Sennett asserts in his 2008 book The Craftsman. Rather, it is a skill that we can only wonder at, the kind of magical, unbelievable skill that enchants as described by Alfred Gell in his 1992 essay The Technology of Enchantment and the Enchantment of Technology. Perry does not share the religious and cultural beliefs of those who produced many of the works he selected, but this doesn’t prevent him from being on the same wavelength. The centrepiece of the exhibition was a metal sculpture of a three mast ship, titled (like the exhibition) ‘The Tomb of the Unknown Craftsman’. He must have made the parts out of clay and then had them cast. This was another of his works that took a long time to absorb, for every surface was full of relief detail. Much of the relief iconography would have been produced by pressing objects into the clay, much as he included photographs amongst the images on his pots. Like his much earlier motorcycle helmet, it looked as if this ship might be an ancient artefact. The passage of time was hinted at in two places where he must have punched a hole through the clay from which the mould for the cast was made. It was a work by somebody who, through the exhibition, we seemed to get to know very well, yet dedicated to ‘all the anonymous craftsmen that over the centuries have fashioned the man-made wonders of the world’. This was a vessel of psychic transformation. It might celebrate craftsmanship but it also symbolised the rich and fabulous journey on which we were taken through visiting his exhibition.